Und noch ein Sockenpaar aus der Resteverwertung. Diesmal waren es zwei größere Reste, einmal von den Space Invader Socken, die mein jüngster Bruder letztes Jahr zu Weihnachten bekommen hat und einmal die Regia Stretch von diesem luftigen Modell. Again „use up your sock yarn“ socks from the last weeks. I only needed two different yarns because what I had left was quite a lot. The cream yarn is from the Space Invader Socks my youngest brother got for Christmas last year, the blue is Regia Stretch from that airy pair. And as plain stripes were to boring for me I added a bit of structure with crossed stitches. 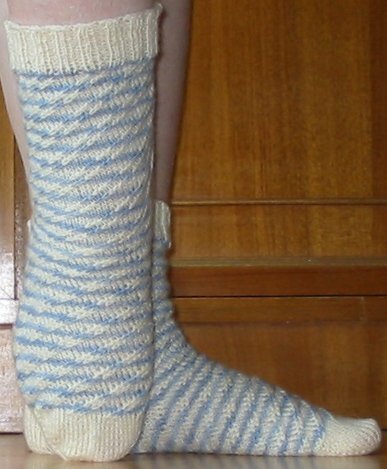 I have to admit that the pattern is not the best you can use for socks, because it takes out a lot of the stretch, but I will keep it in mind for other purposes. When I will be looking for something that keeps its form well. 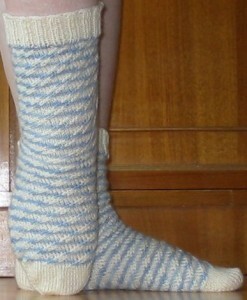 Dieser Eintrag wurde veröffentlicht in Socken, Stricken und Häkeln und verschlagwortet mit Socken, Stricken, Wollreste von nowak. Permanenter Link zum Eintrag.